Bethlehem Steel’s hot streak finally ended Sunday. After pounding three straight opponents by a combined score of 10-1, Bethlehem dropped a 2-1 result at home Sunday to the Pittsburgh Riverhounds. It was Bethlehem’s third game in nine days and fourth in 13, and Pittsburgh was the best of the four opponents and proved it. 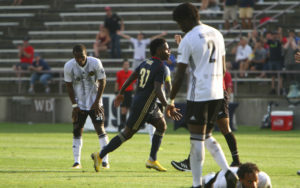 Head coach Brendan Burke anticipated Pittsburgh’s quality and started one of his older sides of the season, as only 18-year-old Anthony Fontana of the Union began the match as a teenager. On the other side, Pittsburgh owner Tuffy Schallenberger hired USL Hall of Fame coach Bob Lilley after the Rochester Rhinos knew they would not field a team for 2018 and has given Lilley the resources needed to build a roster of top- quality, interchangeable parts. It showed. After 15 or so minutes of comparative back and forth play in the middle of the field, Pittsburgh dominated the next 20 to 25 on the clock. They defended in a 5-1-3-1 and attacked in a 3-3-3-1 until they established possession in their offensive third. Then they adopted three lines across. The visitors always had depth positioned to cut off Steel outlet passes whenever Bethlehem managed to recover the ball and recycled it into the attack. Bethlehem were reduced to lumping it high and long in the hope that someone would run onto the ball. Several times Riverhounds potential shooters were wide open in the box and were either not found by ball carriers or put their chances outside the frame. In the 35th minute, Kenardo Forbes found Nico Brett to the right of the goal at medium depth in the penalty box, and Brett did not miss, ending the third-longest shutout streak in Bethlehem Steel FC history at 246 minutes. It was a just result for the first half, as Steel legs looked heavy from fixture congestion. To Bethlehem’s credit, they came out of the halftime locker room flying. In the 52nd minute, Chris Nanco took a feed from Santi Moar up to him on the left, and cut in vigorously towards the top of the penalty box. After eluding one man, in the dead center he pulled a strong shot back to the near post. The Steel’s first shot on goal proved to be their only goal of the game. At the 68th minute, Burke replaced first-teamers Marcus Epps and Fontana with 18-year-old Michee Ngalina and 17-year-old Brenden Aaronson, and all of a sudden Pittsburgh faced increased energy and greater pace up the center and out on the right. Three minutes later came the play of the match, when Bethlehem cleared a free kick from Aubrey to Nanco to Ngalina in the right channel who curled a pass behind the defense to Aaronson perfectly down the center. Pittsburgh keeper Dan Lynd, thought by some to be one of the league’s best, read the danger instantly and arrived at the ball simultaneously with Aaronson. In a full-sprint contest for the ball, he deflected it away at the cost of a knee to the cheekbone, preserving the level scoreline. Lynd walked off the field with heavy support. Lehigh Valley fans gave Lynd a sustained round of applause as he rode a golf cart toward a waiting ambulance. Pittsburgh notched the winning goal in the 79th minute. 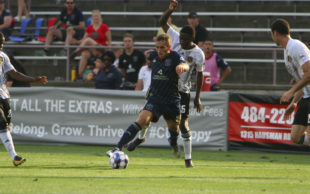 A Pittsburgh clearance just barely eluded the straining toe of captain James Chambers and was seized by the Riverhounds’ Christiano Francois. Some Bethlehem defenders in both outside channels assumed their captain’s toe would reach and found themselves caught out by the Haitian’s afterburners. Nico Brett read his colleague perfectly and executed the other half of a textbook 2-v-1 in front of goal for the lead. The Irishman’s inch-short error reflected a pattern of passes and tackles not quite perfectly sharp that showed itself, especially throughout the last stages of each half. The Steel were simply bone-tired. Bethlehem travel to Rochester to play Toronto FC II on the Rhinos old home pitch Thursday at 7 p.m., bringing the club’s current endurance marathon to an end. Coach Lilley: Watching Bob Lilley’s well-drilled side raises the question of why no MLS club has ever hired him. His tactical shape and assignment of responsibilities within it would be a pleasure for a neutral observer to watch, as each Riverhound knows exactly what to do whatever the circumstance. There were no obvious weaknesses in Lilley’s side. Perceptions that he plays an old-style, outmoded route one game are simply wrong. His team knows when to high press and when to play possession. They dissected Bethlehem’s defense in their own box for 20 minutes during the first half and limited the Steel’s attacking midfielder to 11 touches in the first half and 35 for the game. Santi: With the assist to Nanco, Moar pulled within two of the league lead for the season. A good referee: Guido Gonzales called a tight, accurate, even-handed game, realizing from the tap-off the potential the game had for physicality and chippiness. He called fouls immediately when committed by either side, was loud and clear when allowing an advantage, and seemed accurate and fair the entire match. The key call of the game, the collision, was a simultaneous arrival to the naked eye. Dan Lynd (Mike Kirk 73’); Jordan Dover (Noah Franke 66’), Thomas Vancaeyezeele, Joe Greenspan, Tobi Adewole, Ray Lee; Ben Zemanski (Hugh Roberts 87’), Mo Dabo, Kenardo Forbes, Christiano Francois; Nico Brett. Unused Substitutes: Dennis Chin, Romeo Parkes, Kevin Kerr, Todd Praetzner.